MAST awards its 2019 People of Earth Grand Prize to Reflections, a story and photograph by Allison Merrill. The fire devoured Mama whole. Ate everything. Her silky black hair. Her willow leaf-shaped eyes. Her almost-amputated, diabetes-swollen legs. In Taiwan, when I was little, my family lived in a traditional Japanese house—a minka—that had been a government official’s compound during the Japanese Occupation Era (1895-1945 A.D.). The washroom in this house was an all-tiled-in, underground space that looked like an empty swimming pool, as big as three king size mattresses combined. This place was purely for bathing and cleansing. A faucet on one wall remained on, icy groundwater ran like a waterfall into a kiddy-pool-sized tin tub, about a foot deep, that sat right under it. It overflowed, causing the tiny floor drain to make a perpetual sucking noise. The washroom was separated from the higher dry ground by two sliding panels like a farmhouse door. On the end of the wood-plank hallway, behind the farmhouse door, there was an immediate three-foot drop to the washroom floor. Unlike a swimming pool with a ladder for getting in, the entrance to the washroom was . . . well, for the three-year-old me, a leap of faith. Literally. Every night at bath time, Mama carried a bucket of boiling water from the kitchen to the washroom. She poured out some cold water from the tin tub, and then filled it back up with the boiling water. Her hand circled the tin tub wall, as if stirring soup in a pot, until the bathwater turned lukewarm. I undressed myself and sat at the washroom entrance, my bottom on the cold wood floor, my legs dangled over the edge of the three-foot drop, hyperextended. To get down to the sunken water world of the washroom, I aimed to leap, and hoped to land, on the footbridge that was a wobbly, moldy, wooden shop stool. In the following nights, even with the best intention to please her, and no matter how hard I tried, I didn’t have the courage to make myself fall. Instead, I cautiously reached for the stool with my toes, carefully climbed down to the washroom floor, my back to it, and safely arrived by Mama’s side. I wiggled my toes, rubbed my tummy, and waited for her nod to get wet. She didn’t look at me or talk to me and I wondered if I’d disappointed her. I looked down but there was no cord. I didn’t understand. Another time as she bent over to scrub my face, I noticed a bead-like mole on her right brow. “What’s that?” I asked, pointing. Ah, a gift. On the face. To honor their parental love and to show her fierce gratitude, Mama vowed to keep all her organs. No extraction for teeth with cavities. No laser removal of moles. No hysterectomy. She chowed down painkillers for the never-ending toothache; let hair grow out of the brown moles hanging on her brow; tolerated decades of heavy bleeding, menstrual pains, and bloating. A thankful daughter, she said, makes a virtuous woman. And what would a woman be if not virtuous? Her argument shocked me. Did I cause her pain and sorrow? I sit on the examination table in my OB/GYN’s office in Salt Lake City, waiting for my test results. Even if the doctor speaks my native Chinese, I’ll still be lost with the medical terms he uses. I stare at him. I can feel tension rising between my brows, a headache. I wish someone were here with me. There’s enough space in this room for an interpreter and a trusted friend. They can each take a chair under the poster of fetal development. One of them can talk comforting words while the other holds my hand. Some women say their mother is their best friend, who accompanies them to their OB/GYN appointments. Mama died when I was twenty-four, before I married. Before I knew what it was like to have a cord connecting my baby’s belly button to my Child’s Palace. She passed away on her fiftieth birthday. On a rainy night. On an ambulance. Alone. “Can—uh—cancerous?” I know that word. It stings my tongue to say it. I stare at him again, my mind blank. I nod, thinking of my three teenage sons. I look at the drawing on the file folder: three simple lines touching one another to represent something that’s not simple at all. This is where, for twenty-seven months of my life, I carried my boys in water. Where they splashed and kicked and—maybe—giggled. Where I became a mother. My uterus isn’t three simple lines touching one another; it’s where three precious lives touch mine. A gift. In my tummy. How can I throw it out? Am I an ungrateful daughter? I’ve always wanted to live a long and prosperous life. But mostly, I want to be healthy. I want to be around for my children. Go on family vacations. Go to superhero movies together. Cook them dinner every night. Watch them graduate from college. Get married. Have children of their own. Spending time with them is my way of loving them. My gift to them. There’s no treachery in being a mother who gives her children time. The only day the surgeon is available to operate on me is the day my husband goes on a business trip to San Jose. I drive myself to the hospital before the sun rises, my children still sleeping. The surgeon smiles. The nurses giggle. “That’s cute,” they say in one voice. Someone rubs my bare back with what feels like a piece of moist cotton. Then a cold liquid sensation pinches my lower back. I glance at the wall clock. Seven-thirty. My boys . . . my boys are driving . . . themselves . . . to school right now, while I sleep . . . for the surgery. Take it out. Throw it out. I wake up in a white room, wondering why I’m alone. The wall clock reads nine-ten. I grow impatient and push the call button for a nurse. When a middle-aged lady in a blue scrub comes to my bedside, I ask when the surgery will start. She nods, and then checks my IV. How is it possible? I was—what was I doing? How did I get here? I roll over, my back to the nurse. I’m nauseous. I feel a migraine coming up. My ears ring with the raging pulse in my head. We showed it to you. You just don’t remember. Ridiculous! How can I ever not remember saying thank-you and good-bye to my Child’s Palace? Finally, finally, finally, she could rest in peace. Mama’s brothers denied her wish for a soil burial. Cremation was quick and cheap, they said. I knelt and sprawled into the Child’s Pose on the floor, before the furnace. I was jetlagged. I was nauseous. I felt a migraine coming up. I heard the fierce roar of metal doors open on squeaky hinges. I heard the conveyor belt rolling. I was in the same lobby with Mama’s body, repeating the kowtow motion while she burned. Each time my head touched the cold, hard marble floor at the command of the funeral director, the monks chanted more energetically, louder, faster. The architectural pattern of the crematorium lobby continued into the alcove. A sand box was on a rectangular table at the center of the alcove, and a row of chairs was pushed against one wall. I sat for a few minutes in silence before I dozed off. When the funeral director woke me, I saw the undertaker push a metal cart toward us. On the top tier of the cart was a metal box and an urn. With his gloved hands he set them up on the table, as if preparing to do a live demonstration. With horror, I watched the undertaker do what he did for a living—handling the dead. I’d seen plastic skulls at Walmart during Halloween season, but never a real one. Now I was looking at Mama’s skull, perfectly intact and pure white. A dome. Hollowed eye sockets. Upside down heart-shaped hole for the nose. High cheek bones. Teeth. This was her head, where her brain and mind were shielded. Where her lifelong thoughts and memories were stored. It was in a stranger’s hand now. He held it like a volleyball. I could almost hear my heart drop. He hammered the skull. Once, twice, thrice. The sound of the pounding reminded me of the sound I made when I repeatedly knocked my forehead on the marble floor earlier, each time with belated gratitude for each thing Mama had done for me. Changed my diapers, washed my dirty clothes, breastfed me, bathed me. The skull was destroyed. What was left didn’t resemble a human life. No flesh. No bones. Being burned is dying twice. Who would curse the dead like that? The fire devoured Mama whole. Ate everything: her compass-drawn round face, her heart-shaped smiling lips, her elephant leg-like arms, her thick waist, her flooded lungs, her hairy moles, her cavity-teeth, and the diseased Child’s Palace she dutifully, painfully, respectfully kept all her life. That cord that tied me to her Child’s Palace, I saw it now, and I understood. She gave me a gift. In my tummy. I opened my eyes and caught my reflection in the stainless steel furnace door. Allison Hong Merrill was born and raised in Taiwan and immigrated to the U.S. at age twenty-two. She is a professional fashion/lifestyle model and a writer. For the past eight years she has been living a creative life through separate media: some days she models, some days she writes, but she never found a way to combine these two unrelated fields into a higher form of artistic expression. Not until she discovered the MAST People of Earth contest. 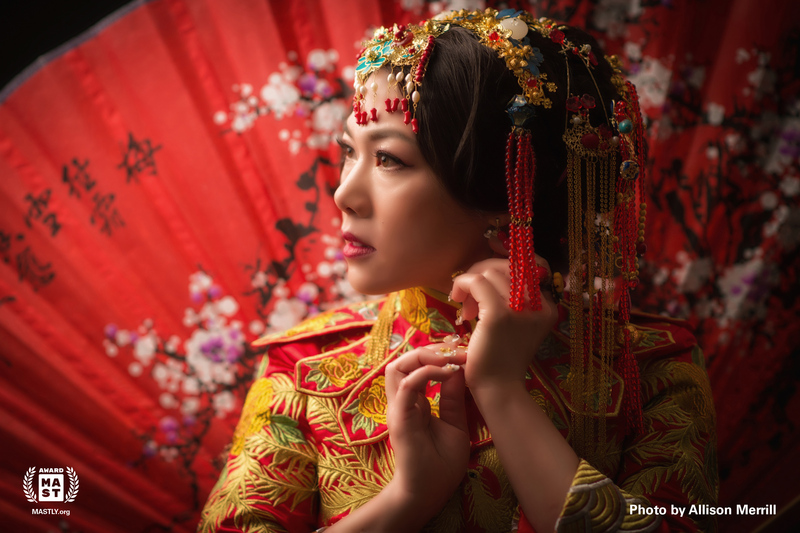 Allison has participated in photoshoots that highlight the diversity of Chinese culture. In her winning piece, The Child’s Palace, she incorporates the image of herself in indigenous Chinese dress with her essay about the beauty and truth of a traditional Chinese mother’s love. Her intention is to bring her modeling and writing lives together to share the poignant story of the loss of her mother. Allison plans to use this unique way of storytelling to write a photographic memoir. And she hopes to share more of her work with the MAST audience.